Superb pre-shave treatment that gently exfoliates and smells great. 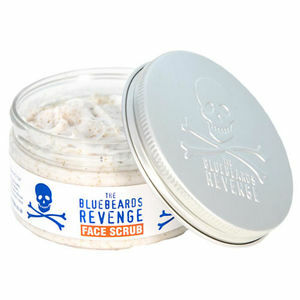 The Bluebeards Revenge Face Scrub is made from crushed, natural olive stones that are suspended in a rich moisturising cream to effectively and gently remove impurities and offer your clients' skin a little well-deserved TLC. It will cleanse, nourish and protect as well as being a great option to use as a pre-treatment prior to the luxury of a barber's wet shave. The rich, creamy scrub contains plenty of ginger, with all of its antiseptic and astringent properties and the product also boasts a signature barbershop scent. A gentle, effective, hydrating cleanser to remove make up and daily grime, with soothing aloe vera and cotton. A specially-formulated, nourishing hydrating mask that restores moisture and soothes and rebalances dry skin. Comes in a 95-ml or 245-ml pot. A fantastic hydrating moisturiser that lasts all day and leaves skin feeling softer, more supple and looking radiant. Comes in a 195-ml and 495-ml bottle. A refreshing and reviving hydrating toner to help slow down skin ageing that softens and moisturises, too. Fun and eye-catching flannel in classic Bluebeards blue and a stylish addition to any barbers. A semi-sheen matt paste for light to medium hold ensuring unkempt hair is kept in place while looking great.